Nancy Yao Maasbach is the President of the Museum of Chinese in America. 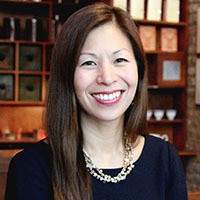 As the President of MOCA, Nancy has the unique privilege of combining her experiences in managing organizations, promoting arts and culture as a bridge between peoples, and executing research focused on examining the role of Chinese Americans in U.S.-China relations. Prior to this position Nancy was the executive director of the Yale-China Association, one of the oldest non-profit organizations dedicated to building U.S.-China relations. At the Yale-China Association, Nancy led over 20 programs in the areas of education, health, and the arts. These programs were lauded as best-in-class and models for bilateral engagement. Nancy has over twenty years of experience working in and covering Asia, including positions at Goldman Sachs & Co. in Hong Kong and New York, Center for Finance and Research Analysis, and the Council on Foreign Relations. Nancy received her MBA from the Yale School of Management and her AB in diplomacy and world affairs from Occidental College. She is a member of the Council on Foreign Relations. She is the Vice Chair of the Board of Education in Woodbridge, Connecticut. Nancy also serves as an independent director of the India Fund (NYSE: IFN) and the Chile Fund (NYSE: CH). Nancy is an American-born Chinese.